Hague Ratification: Fighting the Last War? The Senate has at long last ratified the 1954 Hague Convention for the Protection of Cultural Property in the Event of Armed Conflict. This ends decades of unflagging lobbying by cultural heritage protection advocates, led by the indefatigable Patty Gerstenblith and others. They are to be congratulated on achieving this legislative victory. But lest anyone think that the protection of cultural property in the event of armed conflict is now assured, it is important to recognize what ratification of Hague does and does not accomplish. Ratification does send a strong signal to countries around the world that the United States values their cultural heritage, and it also signals the importance of protecting cultural heritage from the ravages of war. Practically speaking, however, ratification will make little immediate difference in the measures that the United States takes to protect the cultural and historical record of humankind, because we already were observing the provisions of the Convention as a matter of customary international law. During both Gulf Wars, for instance, the United States military took considerable care to gather information on the locations of cultural sites in Iraq and avoided targeting them. We all know that despite this, neither Iraq's National Museum nor its archaeological sites were secured, with disastrous and tragic losses to the record of our human origins. The problem is that the 1954 Hague Convention was designed to deal with a threat quite different from the one that Donny George faced in 2003 or that guards on archaeological sites have faced since then. In 1954, the danger was understood as posed by military actions: bombing and shelling, tank movements, and pillaging, theft, or vandalism by troops. These dangers still exist, and Hague is necessary to force militaries to avoid doing harm themselves to cultural sites. A new and quite distinct danger has emerged in the half-century since the 1954 Convention, however. It comes not from military action, but from military inaction in the face of looting by civilians, fueled by the global market for antiquities that has boomed over the last few decades. While Hague leads the military to fucus on avoiding harm, it imposes no requirement to actively protect cultural sites against the harm that comes from the breakdown in law and order and the concomitant surge in market-driven looting. The obligations it imposes on occupying powers, in fact, seem designed to limit the responsibility of occupiers for securing cultural property, with such responsibility applying only to "cultural property situated in occupied territory and damaged by military operations," only when national authorities are unable to protect it, and even then only so far as possible. Since looting by civilians is not damage inflicted by military operations, Iraq's archaeological sites are fair game and no necessary concern of the US military, which may in fact point to Hague as putting it off the hook for whatever goes wrong. This is not to say that ratification of the 1954 Hague Convention is valueless -- far from it. For one thing, by formalizing what had been a customary observance, it will certainly have a ripple effect within military planning and war-fighting doctrine, and will give a helpful boost to the efforts by the Blue Shield and archaeological organizations to embed cultural awareness training within curricula. We should all celebrate this victory, and then turn our attention to ways of getting national authorities both civilian and military to focus on the real and still unaddressed challenge of securing cultural property from looting by civilians in the aftermath of armed conflict. Another "news story" out as part of the public relations campaign to make it appear that the Provincial Reconstruction Teams are mopping up, now that the looting is over (or never happened). This past May, Iraqi archaeologists were able to visit the areas for the first time since the start of the war. While sites like the carved walls of Nineveh were in drastic need of protection from the sun and wind, the fact that many areas were largely unexcavated probably protected them from looters, according to Diane Siebrandt, cultural heritage officer for the U.S. State Department in Baghdad. It is nice to hear from the State Department that many areas around Mosul were spared the looting that has devastated thousands of archaeological sites in Iraq. But is it really true as a general statement? We have no time-series photos of all the areas around Mosul to verify this. And the sites that have been visited are among a small number that came under US military protection. They have been spared not, as the State Department officer claims, because Mosul's sites are largely unexcavated -- unexcavated sites elsewhere in Iraq have been decimated -- but because we have guarded them. That is something the State Department and the military have been unwilling to acknowledge, since it would obviously point to the need to put military and security resources into guarding sites at a point when the overall administration policy has been to reduce our footprint. We owe it to the Iraqis, and to ourselves, to do more to secure the sites from the looting that is daily destroying more and more of the record of our origins. In my Aug. 30 post, I quoted my colleague McGuire Gibson to the effect that satellite imagery from 2006, 2007, and 2008 purchased by the Oriental Institute disproves the claim that looting declined severely in 2004. This turns out to be a misstatement: the Oriental Institute did have images of the same sites from 2003 and 2008 but not from 2006 or 2007. Images from the 2005-2007 period are being purchased, however, so we should have some more information soon, based on satellite analysis, about whether for those particular sites looting continued during the post-2004 period. If the question is whether looting has ceased in Iraq, however, we do not need time-series satellite photos to prove that it has not. 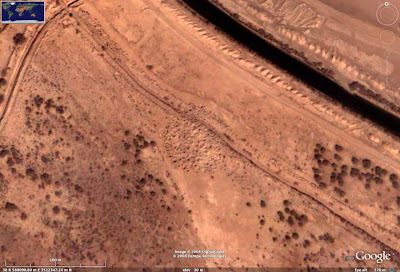 In addition to the other evidence mentioned in other posts to this blog, there is the image above of Tell Shmid, taken this year and posted on Google Earth. The entire site is pitted, and there are fresh holes on the south west side of the tell. Again, as I noted previously, no one site's condition, or even that of several sites, can serve as a proxy for determining the degree or rate of looting for the entirety of the country. To determine that we would need to be able to compare, year by year, the satellite or aerial imagery for at least a representative sample of sites. At Monday's panel discussion at the US Institute for Peace, Donny George Youkhanna responded to the recent articles (most notoriously, Martin Bailey's interview with Dr Abbas al-Husseini) pushing the claim that looting of sites in Iraq is over. Prof. George announced that informants in Iraq who were equipped with mini-cams have filmed looters at work during the past month. It is not clear when this footage will be available, but Micah Garen is said to be finishing his long-awaited documentary and it may appear in that piece. ...according to various colleagues having been to Baghdad (only in the green zone) and one UNESCO colleague having been to Samarra, the situation is not completely under control. To give you one example from yesterday's meeting I had with one official from the Italian Ministry of Culture who was in Nassiriyah on August 10th. He said that the situation is still very tense and there are problems of security. He had to fly with the support of the American army from Baghdad to Nassiriyah. According to him the lack of control by the Department of Antiquities of the archaeological sites is certainly leading to ongoing illegal excavations. Does this prove that looting is ongoing at sites throughout Iraq? No. Does it prove that the Department of Antiquities is not fully in control. Yes. Does it lead one to suspect that looting is going on at the many places where the Department of Antiquities is not in control? Yes. Does it underline, yet again, the importance of American military support for the efforts of the SBAH? Yes. The State Department's Provincial Reconstruction Team in Ninewah Province has issued a report of an assessment of important archaeological sites in northern Iraq that was conducted jointly with Iraq's State Board of Antiquities and Heritage in May 2008. The headline trumpets the finding: "Cultural Sites Safe." To be more specific, the team visited Hatra, Nineveh, Nimrud, Khorsabad (Dur Sharrukin), the Mosul Cultural Museum, the al Hadba Leaning Minaret in the old city of Mosul, and the St. Elijah Chaldean Monastery ruins. They report that, "even though the sites showed signs of deterioration due to the lack of onsite archaeologists and conservators, none of the sites showed signs of looting or extensive vandalism." The first thing to say about this report is that it is heartening to see that the Provincial Reconstruction Teams are working with Iraq's State Board of Antiquities and Heritage. That is an extremely positive development in itself, long overdue, and the State Department is to be applauded for it. That "this visit marked the first time since 2003 that any SBAH representatives have visited these important sites" says much about how little attention was paid by the US to archaeology in Iraq over the past five years, as well as about the unsettledness of the area in which the sites were located. at night to scare off the bad guys,' said Capt. Tom Ehrhart, 29, the platoon commander. 'But the long-term job of protecting this site lies with the Iraqis.'" "At Nimrud, ... [t]he Americans took snapshots of each other standing in front of an exquisite carving of Assyrian angels that had been smashed by thieves." on, the digs at Nineveh were in a sorry state, with signs of plundering. The museum at Mosul was empty and locked up, the director had fled abroad, and one of his assistants, Ahmed Hussein, had been shot dead, allegedly by the Scorpion Brigade, one of the Iraqi government's special forces. So, at least in 2006, a reporter notes signs of plundering. In any case, the lesson is clear: if sites are protected, they will not be looted. It is too bad that thousands of other sites that should and could have been protected as well were not famous enough to warrant sustained attention from the military, which never developed a policy for securing sites or for assisting the State Board of Antiquities in its efforts. The State Department's PRTs represent a civilian version of assistance -- but what is most needful is security rather than conservators, and providing security to assist the Iraqi government is the job of the military. It is not too late to do so now for the State Board of Antiquities, and one hopes that reports like this will serve as a spur to greater site policing assistance, not as an excuse for turning attention away from the problem of looting. The week of May 17th provided an exciting opportunity for the Ninewa Provincial Reconstruction Team (PRT) to support Iraq’s State Board of Antiquities and Heritage (SBAH) with an assessment of conditions at some of the most important cultural heritage sites in Ninewa Province. The PRT hosted Mr. Qais Hussein Rashid, Director General of Excavations from SBAH and Ms. Diane Siebrandt, the Cultural Heritage Officer for the Department of State, US Embassy Baghdad. This visit marked the first time since 2003 that any SBAH representatives have visited these important sites. The overall report was extremely positive and provided a good baseline for future conservation and restoration. The total number of cultural heritage sites in Northern Iraq is too numerous to visit during a short fact-finding mission, so the team concentrated on the most significant sites, including Hatra, inscribed on the UNESCO list of World Heritage Sites and the ancient city of Nineveh, Nimrud, Khorsabad (Dur Sharrukin), the Mosul Cultural Museum, the al Hadba Leaning Minaret in the old city of Mosul, and the St. Elijah Chaldean Monastery ruins. The main goals of the visit were to assess site conditions, determine restoration needs, and coordinate long-range planning efforts between GOI offices, the U.S. government, the Ninewa Provincial governing bodies, site managers, and the international conservation community. Even though the sites showed signs of deterioration due to the lack of onsite archaeologists and conservators, none of the sites showed signs of looting or extensive vandalism. The Mosul Cultural Museum, repository of many of the treasures of the region, requires extensive renovation. Experts will be brought to the province to provide technical advice on state-of-the art security, storage, and exhibition planning for the museum. The overarching goal is to allow the Mosul Cultural Museum to retrieve their collection from Baghdad where it was moved for safe-keeping prior to the start of Operation Iraqi Freedom in 2003. The collection, which includes priceless treasures from excavations at Nimrud and other sites in the Province, will not be returned until security measures at the museum are improved. The week-long fact-finding mission resulted in a plan of action for each site. PRT staff members are working with local officials and SBAH to develop long-term management strategies to be implemented jointly with the assistance of outside partners. In addition to UNESCO, the PRT hopes to involve universities, museums, and NGOs from around the world to assist in the conservation activities. Mosul University’s Archeological Department will become active partners in the restoration activities that will result in development of active partnerships with other interested universities and non-governmental organizations. generation of jobs and economic opportunities as part of a larger long range tourism economic development planning effort. As a result of this important visit, the assessment team believes the cultural heritage resources of Ninewa will become a major economic driver for the region and contribute to the long-term economic success of Iraq, as well as serve as a significant source of pride for the Iraqi people. What Should an OPEC-style Antiquities Cartel Demand From Market Nations? Derek Fincham has an interesting recent post here reflecting on the prospect that countries of origin for antiquities are likely to band together OPEC-style to negotiate as a bloc, rather than continuing the individual dealmaking that has so far been the case. Fincham assumes, perhaps rightly, however, that even as a bloc antiquities-rich nations are unlikely to play hardball in demanding restitution and/or more stringent import rules because of the need to maintain good relations and thereby encourage increased tourism that can provide revenues needed to bolster site protection. carries with it the distasteful tradeoffs, such as the commodification of heritage, and the wear-and-tear which millions of visitors will always cause. Hopefully nations of origin will be able to move beyond the dramatic repatriations, which are a necessary step, and continue to work to preserve the sites themselves. But it is difficult to see how countries of origin will be able to do more to preserve the sites themselves absent some concerted effort to demand that any deal involving repatriation and loan agreements also involve some mechanism for generating revenues for site protection from within the market states, not from tourism dollars. The most appropriate source for such revenues is the antiquities market. Imposing a tax on all sales of antiquities would require lawmaking, of course, and countries of origin may feel it would be easier to make a deal with individual museums and collectors than to pressure them to call on Congress to tax the antiquities market. Dealers are almost certain to oppose any such measure, as well. But a cartel is far more powerful than any individual country, and with the stick and carrot of repatriation and loans in hand countries of origin have at least a chance to succeed. Surely it is worth a try. I can't guarantee it will happen tomorrow or at all, but Fox News wants to push the "news" that archaeological experts have been wrong about claims that looting of archaeological sites in Iraq since 2003 has been widespread. Someone should ask them why none of their reporters has been out to the sites to get the real story. Please do not misconstrue this as indicating that the military is seeking this information. I had contacted the DIA last year to learn more about their role in the run-up to the 2003 Iraq war, and I contacted them again recently because of my own concern about the possibility of some sort of military action being contemplated against Iran. I asked who could be contacted. A resolution suggesting that no archaeologists or cultural heritage specialists assist the military in planning to protect the cultural heritage was passed by the Plenary session of the WAC-6 Congress for consideration by the World Archaeological Congress Assembly, Council and Executive but was not approved as a formal statement of the position of the organisation as a whole. Will the Status of Forces agreement address antiquities protection? A few blogs back I raised the question of whether the Status of Forces agreement under negotiation now would include any provisions for protecting Iraq's cultural heritage. Micah Garen has some new details about that. He reports having spoken to a Department of Defense spokesperson who "refused to say whether protecting cultural history was part of the negotiations." Garen adds however that the State Department has said on background that cultural history has been brought up in the discussions -- good news indeed, if true, though the devil is in the details. A few days after the McCain campaign released a list of 300 economists who supposedly support his economic plan, we learn this was a bit of a bait-and-switch, since the statement they signed was extraordinarily vague. The McCain campaign’s economic team, led by adviser Douglas Holtz-Eakin and former eBay CEO Meg Whitman, began collecting signatures from economists several months ago, with the intention of showing support for McCain's broad economic priorities, rather than the specific items in his Jobs for America proposal. The statement they signed is 403 words long — and there is no mention of the gas tax holiday or the deficit, which the Congressional Budget Office projects will approach $400 billion this year. For that reason, Gary Becker, a Nobel Prize-winning economist at the University of Chicago, said he definitely supports the plan, even if he is not completely familiar with its specifics. "I like the main thrust of the plan,” he said. “I felt that I could support it without knowing every detail." Yes, those pesky little details do get in the way. And really, it is too much to expect an economist to familiarize himself with such minutiae. If the average person is hornswaggled into believing that Gary Becker thinks a gas tax holiday makes economic sense, well, no big deal. Seriously though: Does Gary Becker support a gas tax holiday? Does he believe that McCain's budget plans are credible? If not, will he please issue a clarification to the effect that while he supports McCain's plan, he thinks the gas tax holiday is a gimmick and the budget plan a fantasy? Or will he permit the McCain campaign to continue to use his name to mislead the American public? Before turning to the question of whether the resolution passed by the WAC is a good idea, it is important to look at how the press release issued by the Congress frames and justifies what it is arguing should be done now in relation to war plans being prepared for Iran. The release implies strongly that archaeologists who prior to the 2003 invasion of Iraq "were asked to provide (or volunteered) information on sites 'to be spared'" should have refused to do so because such providing such information lent "cultural credibility and respectability to the military action." Did that really happen? Did archaeologists who provided site coordinates to the Defense Intelligence Agency or its British counterpart lend credibility and respectability? Such information, we know, did enable the military to avoid destroying archaeological sites, buildings, and monuments, as they were compelled to do in order not to be charged with war crimes under provisions of the 1954 Hague Convention. I suppose one could believe that not being a war criminal is the same thing as being respectable, but most people would make a distinction between the two. Would members of WAC be in favor of jettisoning the 1954 Hague Convention so that the military would have no legal obligation to collect site coordinates and create "no-strike" lists? For archaeologists, on the other hand, engagement with the war planners made it possible for those involved to do what the WAC resolution insists they should do: emphasize "the detrimental consequences of such [military] actions for the people and the heritage of the area." They did so not just publicly but also directly and repeatedly to policymakers and planners. Archaeologists who took the clean-hands approach advocated in the WAC resolution also attempted to influence public opinion, to be sure. They did garner some publicity. But they had no discernible effect on public opinion, either before or after the war. Those who worked with the military, on the other hand, were able to explain to the public, in the wake of the looting of the Iraq Museum, that they had directly warned officials in the Pentagon and the State Department (where their meeting was with Ryan Crocker, by the way) that the museum would almost certainly be a target of looters. Their testimony in the press had a very powerful negative impact on the credibility and respectability of the military action. One more thing worth noting: Word that archaeologists in the US were meeting with Pentagon and State Department officials as well as targeters to make sure that the military knew the museum would be a target reached Donny George in Baghdad. George used this fact to try to persuade his superiors in the Iraqi cultural bureaucracy that it was time to begin packing up the museum and battening down its hatches. He would not have been able to make that argument had archaeologists merely boycotted the entire warplanning process. one which places particular emphasis on archaeological ethics. considerably criticism from many of their colleagues. resolved through peaceful and diplomatic means. cultural professionals as well as the wider public”. “Archaeologist and War Task Force” (y.hamilakis@soton.ac.uk). "The three archaeologists agree that their limited visit provides little new data on the host of other sites in southern Iraq that satellite data suggest may still be plagued by looting. Hamdani says that smaller and more remote sites are especially vulnerable. The international team was unable to visit any of these sites, although Stone confirmed that remote-sensing images show widespread damage to ancient settlements in the area." So much for the notion that this report "contradicts" claims of widespread and sustained looting. One can only wonder why the reporter for the Art Newspaper did not ask the three archaeologists the question Lawler did. Could it be that the story's slant was designed to appeal to a readership eager to be told that it was fine to collect Iraqi antiquities since looting was non-existent? 1. Transparency must be established in a way that satisfies the archaeological community that the provenance of antiquities is clear. That means creating a legally-binding mechanism for reviewing and approving antiquities for sale (presumably a board that would be run by archaeologists). It also means requiring all sales that take place to be registered so that it is known who is buying and selling, and at what price. 2. 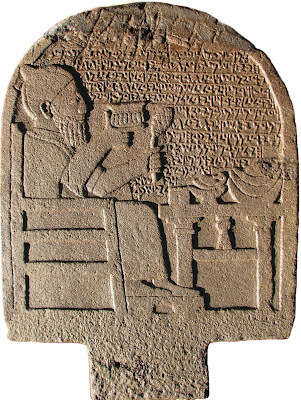 Sales of approved antiquities could then be not simply tracked, but taxed, in the model of sin taxes or user fees, with proceeds dedicated to a) paying for the provenance-review board, and b) funding programs (probably run out of the State Department's Cultural Heritage Center) that assist anti-looting and anti-smuggling efforts in those countries from which the artifacts originated. A tax of 5% on the Mesopotamian figurine recently sold for $57 million would have yielded a sum greater than the total 2003 budget of the Iraq State Board of Antiquities. Doubling their budget would dramatically improve their capacity to tamp down on site looting. 3. Both the provenance-review committee and the bureaucracy for administering anti-looting and anti-smuggling programs can be paid for from the tax proceeds. Ideally, there would be a governmental agency that would allocate tax proceeds to both these efforts, but the U.S. has no such agency. An oversight board should be created for this purpose. Elizabeth Stone (Antiquity, vol 82, March 2008) quantifies the extent of looting in southern Iraq. Stone examined almost 10,000 square kilometres of imagery, containing some 1900 archaeological sites. She says 15.75 square kilometres of land have been intensively looted, including 213 archaeological sites. This is an area four times greater than all the archeological excavations undertaken in southern Iraq over the past century. Stone has confirmed for me in an interview that the most recent imagery she has been working with is "not in the real heartland of looting. That area has not been imaged that recently." Sites in Iraq Not Looted? Get Real! As expected, the Art Newspaper article is spawning claims of massive looting of sites in Iraq are somehow a myth promulgated by the left or by disgruntled archaeologists. "Widespread looting had affected the whole region [the southwestern Iraqi province of Dhi Qar] after the collapse of the regime in 2003. As of early 2007, grave robbers still combed archaeological sites, hunting for gold jewels, gems, and cuneiform tablets..." "Since the beginning of the operations in Nasiriyah... 1,636 looted archaeological objects have been seized..."
Also mythical would have to be the 17,000 artifacts looted from unregistered archaeological sites that had been returned to the museum, as reported by Donny George in 2006. And let's not forget those mythmakers, the Polish civil-military contingent posted to Al Qadisiyah province, who reported in March 2005 that aerial reconnaissance showed "continuous and methodical illicit digging that neither the Coalition troops entering Iraq nor the local antiquity service have been able to prevent." Now it is true that all these reports are now dated. Time does go by, and one can always say that we do not know what has happened within the last year, last six months, etc. etc. But there can be no doubt that since the invasion many, many sites have been looted. Donny George's figure of 17,000 items returned is greater than the number stolen from the museum, and of course must be only a small fraction of the total looted since the invasion. John Russell has estimated, based on the number of hectares known to have been looted compared to those that yielded the 170,000 items in the Iraq Museum, that 400-600,000 artifacts have been taken illicitly. These are of course very rough estimates, but they give a sense of the scope of the looting. "An international team of archaeologists which made an unpublicised visit to southern Iraq last month found no evidence of recent looting—contrary to long-expressed claims about sustained illegal digging at major sites." 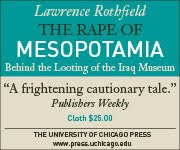 "We reported last month, in a review of a new scholarly book on Iraq’s cultural heritage, that Professor Lawrence Rothfield of the University of Chicago claims that sites are being “destroyed at the rate of roughly 10% a year”. One problem: there is no contradiction here. Archaeologists have been claiming that sustained digging has taken place at sites both major and minor, but that is not the same thing as claiming that every site in the country has been looted, or even that every major site has been looted. Indeed, it has been known for several years now, from analyses of satellite imagery by Elizabeth Stone, that in general the sites in the south had not seen as much looting as of those she studied from the middle of the country, where the devastation has been enormous. Stone's analysis showed that the major sites in the south -- the only area this assessment team visited --had for the most part remained unlooted, at least through 2005, the latest date for which satellite photos were available to her. It was already clear from Stone's analysis that the 8 sites visited were unusual in not having experienced the kind of severe looting that Stone found elsewhere in the country. The real question is: why were these sites spared? 1. Ur: this site was protected before 2003 being surrounded by the Iraqi air base, then after 2003 protected by the American air base, together with the good protection of the Iraqi guards and FPS patrols. 2. Larsa: this site is in a remote area, almost covered by sand dunes, which made it very difficult for the looters to approach, most of the times. 3. Uruk: This site had always been very good protected by its guards and their tribes, there have been some attempts of looting, but they were strongly stopped by the guards and the local authorities. 4. Lagash, There had been some attempts of looting to this site, but not that much all the time, yes it is very well known in the world of archaeology, but it never had extensive looting like the others. 5. Eridu, This site had been surrounded by water for some time before 2003, and later dried, so it was not so vulnerable by the looters, although it is very well known in the world of archaeology, but also known of having extensive archaeological excavations by the Iraqi antiquities service, which maybe left nothing for the looters, in their opinion, and the excavations there are completely covered, except for some bricks on the surface of one mound only. 5. Tell Lahm: This site has been looted to some extent, and has been disturbed by the diggings of the Iraqi army in 1991, first Gulf war, but since this site is in the closest point between the high way between Basra and Baghdad, and the local road between Basra and Nasiriyah, and there's always been been a check point there, because of that situation, and the American forces use both ways extensively, I think the looters abandoned the site from early times. 6. Ubaid: This site had had some looting just after the 1991 war, and maybe some more just after 2003, but since being very close to the city of Ur, made it on the way of the Iraqi FPS patrols and the American forces from the beginning, so I believe it was very hard for the looters to continue in these circumstances. 7. Oueili: very well known in the world of archaeology by the French excavations and publications, but it is a prehistoric site, it produces nothing of the materials that the looters want, maybe they have checked it and abandon it, because of that. George concludes: "Again with all my respect to the courageous action these leading archaeologists had done, but this is my personal point of view, but I want to believe that there will be some more trips for other sites in the near future." Why does it matter whether the story is badly slanted or not? Two reasons: First, because its slantedness has political implications. The story has been pounced upon by the rightwing blogosphere -- newrepublic.com posted it instantaneously -- since it leaves readers with the impression that, as one rightwing commenter on the story has already put it, the claim of massive looting of sites "was just another story fabricated by the Boston Globe and New York Times." Second, and far more important, because in addition to enabling deniers to claim that nothing has happened or is happening that needs our attention, the reporter misses the real story, which is about what we can learn from the happy fate of these 8 sites. Nearby bases, checkpoints on major roads, increased FPS patrols, help from locals, as well as training equipment and guard towers bequeathed by the carabinieri: all these make a real difference. That's the real surprise, one the story misses.